Shift, a large-scale environmental installation created for the Arvada Center for the Arts and Humanities, consisted of a wedge-shaped room, constructed of muslin cloth and wood. 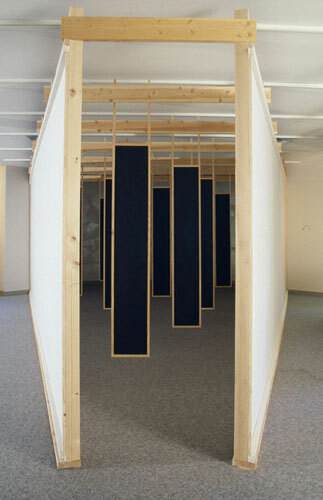 The viewer entered the triangular room through a small wooden gateway to see a space containing a triangular shaped form made of hanging black wood-backed mirrors. Images of earth and sky were projected on the walls of the room, and when participants looked into the mirrors, their own physical form was reflected and integrated with surrounding images of nature.